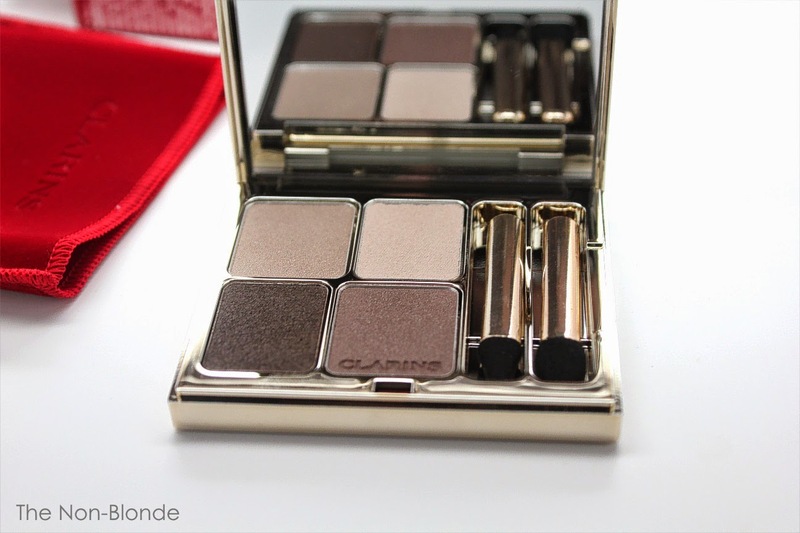 Skintones is one of Clarins six permanent mineral eye shadow palettes that were released not so long ago (there are also a couple of seasonal limited edition ones, and I just saw a new spring palette containing the requisite pinks and greens). Skintones is the most neutral of these quads, containing basic colors that makes it a true workhorse. It's not that I didn't have my eye on the one in Indigo, but I settles on this one. Because taupe. This Clarins mineral formula is quite pigmented, but the texture varies from one color to another. 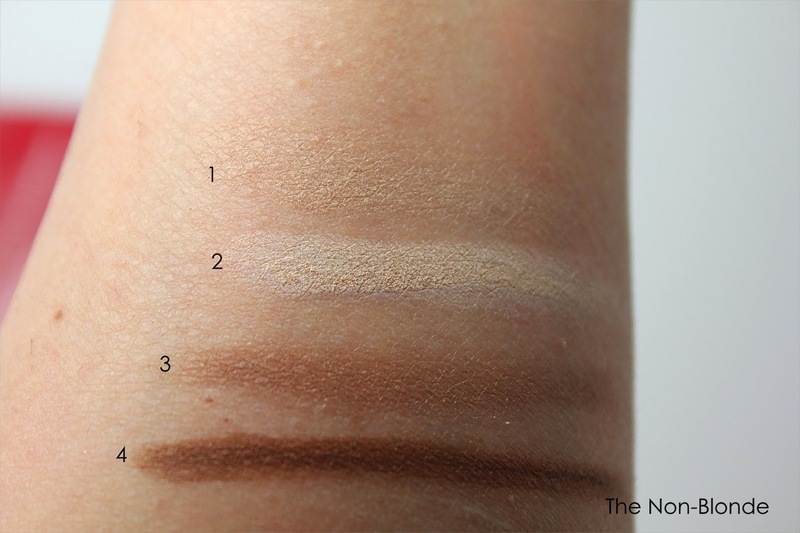 As I was swatching #1, the wet sand shade that's nearly identical to my own skin tone, I had to press quite a bit to get the product, while when I moved to #2 I got too much product on as you can see above. Eye shadow #2 is not chalky or powdery; as a matter of fact it's almost as creamy as the color itself, so one needs to use about one third of what I had on. I was surprised with #3 and #4. In the pan both look like very cool toned grayed browns. On my skin (which is known to warm certain colors considerable) #3 is a warm medium taupe and #4 is straight on deep brown. They're very nice colors, but hoped for the more unique look of the pan. The texture and finish are smooth, with #1, #3, and #4 having a satin look and the creamy #2 is more of a matte. All of them, including the harder #1, blend well and last until you remove them. Bottom Line: basic, but great quality. 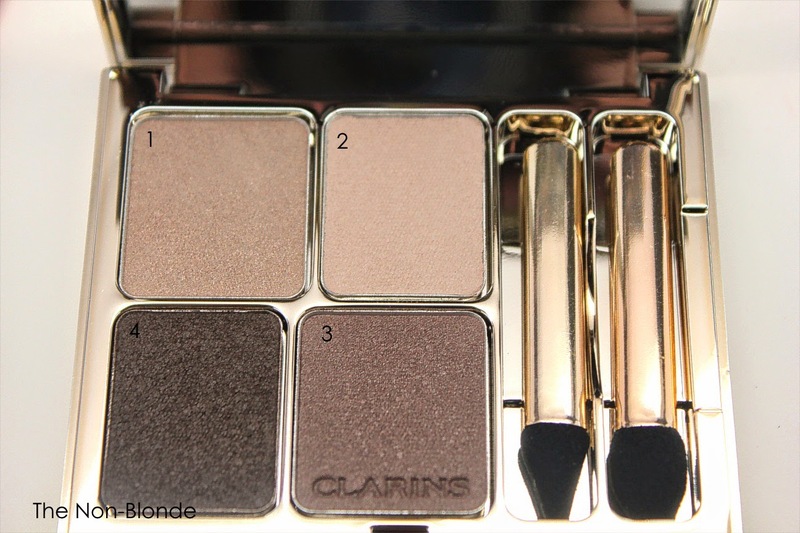 Clarins Eye Quartet Mineral Palette Skintones ($42) is available at the counters and online from most department stores. I LOVEEEEE this palette! Looks so boring in the pan, but makes for an amazing neutral eye. Why Haven't I been Wearing It More?